To Weight or Not! Should You Use an Atlatl Weight? We are often asked if someone needs an atlatl weight on their newly purchased atlatl. We usually suggest is that you try the atlatl first without the weight and see how it works for you. Wondering if you need a weight? Try attaching a small stone on the atlatl shaft and see if it makes a difference for you! Weights add balance and stability to an atlatl system. They improve accuracy for many atlatlists and make it easier to hold the atlatl steady while aiming at the target. One reason it helps is to steady the atlatl is that it balances the weight of the dart. It also adds inertia to the system, which tends to minimize shaking and wiggling caused by the atlatlist�s body functions such as heartbeat and respiration etc. Depending on the placement of the weight on the shaft of the atlatl, there is also more or less of a �pendulum effect� which helps to stabilize the swinging atlatl during the shot. Placing the weight closer to the hook end of the atlatl produces more of the effect at the expense of some of the speed or energy of the shot. We have a nice selection of atlatl weights in stock. 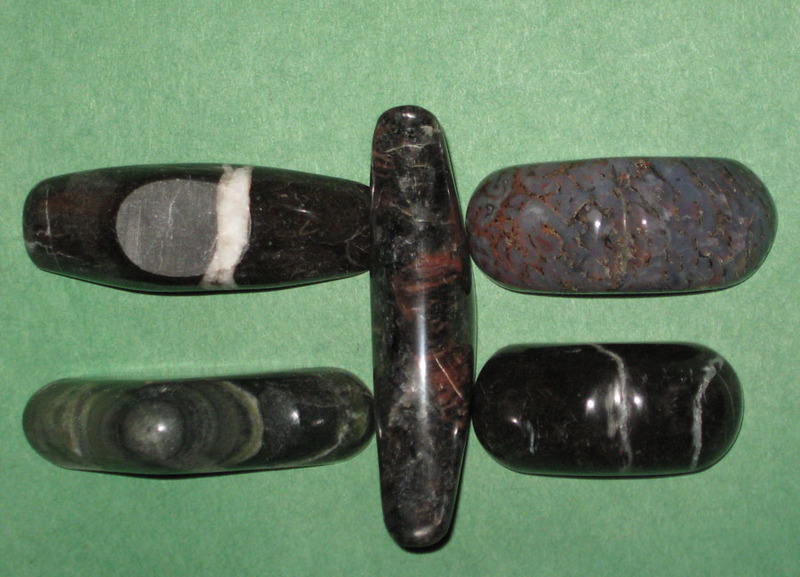 If you think you would like to try a weight, we have a variety of weights available ranging from $5 to $20 on up to semi precious polished stones. Others can be custom-made for you. 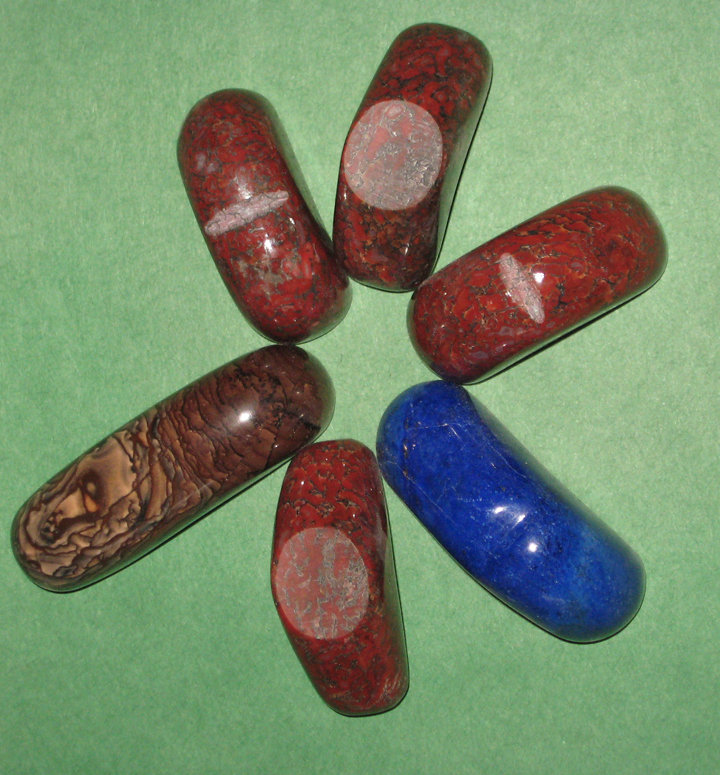 Prices for atlatl weights are made of so many different materials, from common to precious, that prices vary greatly. If you would like more information about atlatl weights, give us a call at 800-836-4520 or 607-743-4379. The most effective method of hafting stone and bone points is with cellulose based fiber and glue. The glue can be modern or traditional. I use hide glue, pine or copal resin, or modern glues like Elmer�s, Carpenters Glue or epoxy. Animal fibers tend to fail faster when they get in contact with water. Cellulose fibers like yucca, basswood, hickory, flax, hemp, dog bane, and cotton have proven to be better than sinew each and every time I have used them in real hunting situations. I prefer flax, hemp and dog bane fibers. Rain, dew, blood and wet earth get in contact with sinew and it turns to slime and releases the haft. It also turns a hafted point into a dog bone. Something will eat it sooner or later. Hide glue is also affected by water. Tree resins are very water resistant and work well if they are not too brittle. Pine resin can be tempered with charcoal, dung, bees wax and fats which make the resin less likely to be brittle. Many different recipies have been used for this purpose. The combination of hide glue and cellulose fibers shrinks and tightens up the hafting. If you saturate linen cloth with hide glue and stretch it on a frame it is drum tight after it dries. I learned this from making canvases for oil painting. I also read, but have not confirmed this with my own experiment, that linen cloth saturated with hide glue applied to glass will actually break the glass when it dries. I also have been experimenting with pine and copal resin as a sealant for hafting. After the glue dries I apply several coats of thinned pine resin or copal resin to the hafted area. This makes a very hard, smooth, and water resistant haft. The reason I like this method is that the surface of the fiber, after it is coated this way, offers little resistance to penetration. Copal resin is fossilized pine resin that gets very hard after it is dry. Pine resin remains sticky for a long time. I don�t know whether this method is �traditional�. I use turpentine or alcohol to thin the resin. You can melt both resins over heat to apply them also but this is more difficult. It is also possible to use runnier fresh pine sap, then heat the finished piece to encourage drying. I also use the copal resin thinned into a “shellac” on the thread whipping that holds the front and back of my fletching down. A thin coating of the thinned resin on the dart shaft itself makes it virtually water proof and will adhere the fletching to the shaft. To make the thinned resin put a few pieces of pine resin or copal on a square of cloth, tie it closed with string, place it in a glass jar of turpentine or denatured alcohol with the lid tightened. Every now and then shake the jar. After a while the resin will be dissolved. The bark and dirt will remain in the cloth. Copal resin works a lot better than pine because it dries in a half an hour or less. When I was in 8th grade I found a dart point on the edge of the newly built ball field. I was running laps during track practice and that dark shiny object caused me to stop and investigate. This was an epiphany in my life; a split second chance happening that changed everything that would follow. Its effects didn�t happen right away, but later is when I was much older. The shadow of that event was like a hard shelled seed fallen to the ground waiting to germinate and blossom when the right conditions made it favorable. I held that point in my sweaty hand for the next few days, even at night when I went to bed. I wanted so much to know about the person who made that object that I dreamed about him. When my son Peter was learning how to read I took him to the local library to peruse the books in the children�s section. Meanwhile I took the opportunity to read everything I could in the section of the shelves dedicated to archaeology and anthropology. It was that point that drew me into reading all those books. I now know that it was a mid archaic point made by a man who lived along the Susquehanna River perhaps a dozen or more centuries ago. Part of the spirit of that man who shot that atlatl dart so many centuries ago was reborn in me and made me into who I am today. Archaeologists have been agonizing for a long time over the use of banner stones. Some have offered that they are atlatl weights or ceremonial pieces. Others have suggested that they are for drilling, cordage making, or fire making. This theory proposes that they are part of a kit of tools used to make and repair atlatl darts. My theory also proposes that there is an interrelated purpose for several common artefacts. My theory has met with a lot of skepticism and resistance because of the works of William S. Webb, who proposed that the bannerstone was actually part of an atlatl. He sites �in situ�evidence which consists mainly of bannerstones found in line with atlatl handles and hooks in graves that archaeologist dug up during the construction of the Tennessee Valley Authority�s massive water control system in the southeast during the early part of the 20th Century. He proposed these theories without a complete knowledge of how atlatls work. I sincerely doubt that he ever hunted with one or tried to make or repair an atlatl or dart in the field with only stone age style equipment. By way of proof, I took the hard and durable remains that one finds in almost any Indian artefact collection, and filled in the missing pieces of wood, cordage, glue, feathers, leather and bark, by way of a series of experiments. The experiments were designed to produce working, practical weapons, tools and techniques like what may have been used by the Woodland era American Indian. Then I and my friends field tested them during actual hunting and fishing expeditions. I started out this endeavor not to prove this theory but in a personal quest to learn how to hunt and fish using the atlatl. I experimented with the bannerstone, gorget, atlatls and darts, celts, projectile points , fire by friction, cordage making, and primitive hunting techniques using mainly the atlatl for more than ten years. Much of what I did required learning and mastering difficult and complex skills such as flint knapping, marksmanship and hunting with an atlatl, atlatl fishing, wood working with stone age style tools, cordage making, tracking, and making fires with friction. I now consider myself to be fairly proficient in all of these skills. These skills required a lot of practice and a willingness to go places where the resources for learning them were available. The most important of the resources were the people that I encountered on my quest, not to mention the many material things that so many people shared with me along the way. I owe a great deal to people I now consider friends whom I met along the way who shared in my quest. Many people have asked me what motivated me to do this. When I was about ten, during recess I found a dart point on the newly graded ball field near my school in Apalachin, New York. I remember vividly that artefact could not be pried from my hand for several days. In fact I took it to bed and held it in my hand when I went to sleep the first night I had it. The plowed fields around our farm in Apalachin held many small rounded pebbles of Onondaga chert. I often would pick these small pieces of glacial till up and attempt to make arrow heads out of them. At the time my favorite tool was a pair of fencing pliers. I was never very successful and my life led me on to other things, but in the recesses of my mind lingered a desire to learn more about these things. As my son, Peter learned to read I would often take him to the local library in the evenings and while he perused the children�s books I discovered the archaeology section, which I read from one end to the other. The bannerstone was used as a spindle weight to make string to tie on fletching and points , and a spindle weight to turn and taper dart shafts. It was not part of the atlatl at all but was carried in a kit, made from bark or leather, with the atlatl. It was probably fastened by pressure fit onto a round stick about the same length as an atlatl. The kit would most likely also contain a wad of fiber, several flint points, scrapers, pine pitch or other adhesive material, and some feathers for fletching. We have a model for the use of the bannerstone in the form of the Navajo spindle. The Southwest Indians have been using this design for longer than they remember. The Navajo spindle has a wooden wheel that works just like the bannerstone did in my experiments. In an experiment I contributed to with Erica Tideman of Ohio, who was gathering information for her doctoral thesis, she compared (among other things) the speed of hand cordage making to spindle made cordage. In the time it takes me to produce one foot of hand made cordage (I am very adept at it) I can make three yards of thread on the bannerstone spindle whorl. A typical dart uses about three yards length of thread to haft the point, whip the shaft behind the point, tie on the fletching and whip the dart shaft in front of the knock dimple. The time saved is enormous considering that on a typical hog hunt I have expended as many as seven darts that I either had to replace because of damage or repair. This use is an effective time and labor saving feature, which alone could explain why bannerstones were carried by early American Indians. But there is more. In the process of making darts I also used the bannerstone as a fly weight to help to make my darts round and also to taper them. This experiment was partly conducted at Mercyhearst College with Cathy Pedler and several of her students at a dig in Northern Pennsylvania. We cut down an ash tree and split it into dart sized staves using only stone and bone tools. I used flint scrapers to shape the trapezoidal shaped stave into roughly a round shaft. I formed the front end of the shaft so it would fit tightly into the bannerstone and spun the dart powering the device with a simple bow like one would use to start a fire by friction. I used ground flint chips as an abrasive by adding them dry into a cone shaped piece of leather that I held in my left hand around the spinning dart shaft. The result was impressive as this method created a perfectly round shaft that was smooth and consistent. When you consider the fact that the bannerstone is difficult to make, and balanced in its design so that is dynamically concentric. It was obviously designed to spin in whatever its function was. In its use as an atlatl weight there exists several problems in its practicality. First and foremost is that atlatls do not spin. The size of the holes in bannerstones are variable from 1/4 inch to over an inch with most of them being about the expected diameter of a typical dart. A quarter inch atlatl shaft is too small and a one inch shaft to large. (Almost all atlatl shaft sizes all lie within an expected parameters which is about on the average one half to a quarter square inch in cross section. The average of cross sections of the 150+ or so broken bannerstones in Gary Fogelman�s collection is a fifth to a sixth of an inch. Too close to call but a significant difference. We examined wear patterns in Gary Fogelman�s collection of broken banner stones. Many have wear patterns that are consistent with the use that I am proposing. Some of the banerstones had been broken and repaired in ancient times literally being sewn back together. Another problem with the bannerstone is its weight. Many of them simply are too heavy to be atlatl weights. I have seen bannerstones that weigh more than a pound. Most weigh more than 100 grams. Compared with objects known to be atlatl weights the difference is very significant. Although my experiments and the evidence is certainly not conclusive, it is compelling. What I can say for sure is that there are lots of problems with bannerstones as atlatl weights. Whereas I perceive from my perusal of the evidence that I have been able to check, coupled with a great deal of experience in using atlatls that practical uses for the bannerstone exist that can be easily replicated that prove to be significant advantages to a hunter using an atlatl in stone age America.